Posted by admin in activity reports, Aso, Batu Tara, Chile, Dieng Volcanic Complex, Dukono, eruptions, Hawaii, Indonesia, Japan, Kamchatka, Karangetang, Karymsky, Kilauea, Kizimen, Kliuchevskoi, Pacific, Papua New Guinea, Popocatépetl, Puyehue, Rabaul, Russia, Sakura-jima, Shiveluch, United States, Vanuatu, Villarrica, Weekly Volcanic Activity Reports, Yasur. 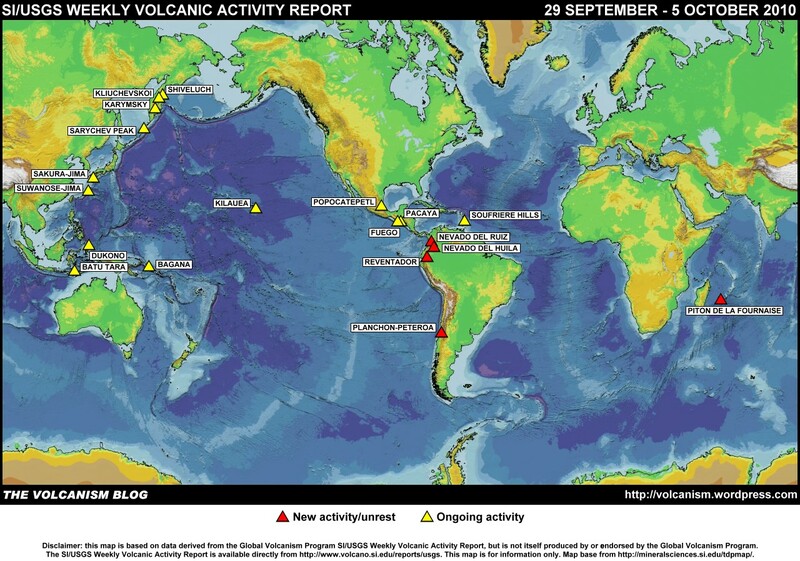 The Smithsonian Institution/United States Geological Survey Weekly Volcanic Activity Report for 1-7 June 2011 is now available on the Global Volcanism Program website. The following is a summary and not a substitute for the full report. 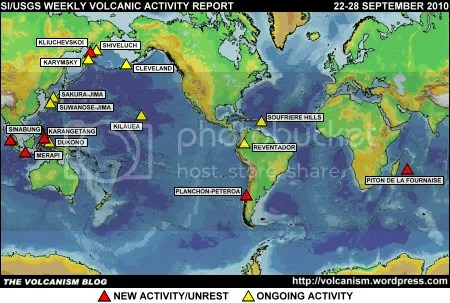 New activity/unrest: Aso (Japan), Dieng Volcanic Complex (Indonesia), Kliuchevskoi (Russia), Popocatépetl (Mexico), Puyehue-Cordón Caulle (Chile), Yasur (Vanuatu). 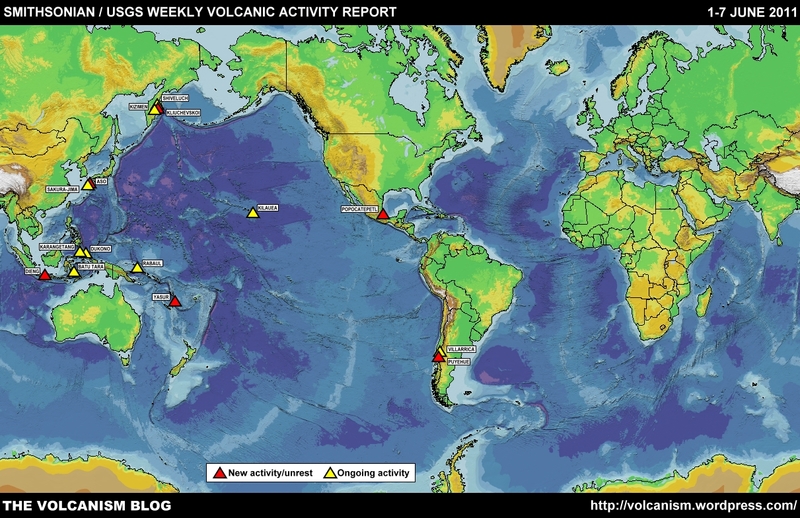 Ongoing activity: Batu Tara (Indonesia), Dukono (Indonesia), Karangetang [Api Siau] (Indonesia), Karymsky (Russia), Kilauea (Hawaii, USA), Kizimen (Russia), Rabaul (Papua New Guinea), Sakura-jima (Japan), Shiveluch (Russia), Villarrica (Chile). Posted by admin in activity reports, Aso, Batu Tara, Costa Rica, Dieng Volcanic Complex, Ecuador, Grímsvötn, Hawaii, Iceland, Indonesia, Japan, Kamchatka, Karymsky, Kilauea, Kizimen, Kliuchevskoi, Mexico, Papua New Guinea, Poás, Popocatépetl, Russia, Sakura-jima, Shiveluch, Taal, Tungurahua, Ulawun, United States, Weekly Volcanic Activity Reports. The Smithsonian Institution/United States Geological Survey Weekly Volcanic Activity Report for 25-31 May 2011 is now available on the Global Volcanism Program website. The following is a summary and not a substitute for the full report. New activity/unrest: Aso (Japan), Dieng Volcanic Complex (Indonesia), Grímsvötn (Iceland), Kliuchevskoi (Russia), Ulawan (Papua New Guinea). Ongoing activity: Batu Tara (Indonesia), Karymsky (Russia), Kilauea (Hawaii, USA), Kizimen (Russia), Popocatépetl (Mexico), Poás (Costa Rica), Sakura-jima (Japan), Shiveluch (Russia), Taal (Philippines), Tungurahua (Ecuador). Posted by admin in activity reports, Bulusan, Caribbean, Dukono, Ecuador, eruptions, Etna, Fuego, Guatemala, Hawaii, Indonesia, Japan, Kamchatka, Karymsky, Kilauea, Kizimen, Manam, Merapi, Nicaragua, Pacaya, Reventador, Russia, Sakura-jima, San Cristóbal, Santa María, Shiveluch, Soufrière Hills, Suwanose-jima, Tungurahua, United States, Weekly Volcanic Activity Reports. The maps accompanying this report will be available shortly – apologies for the delay. The Smithsonian Institution/United States Geological Survey Weekly Volcanic Activity Report for 5-11 January 2011 is now available on the Global Volcanism Program website. The following is a summary and not a substitute for the full report. New activity/unrest: Etna (Italy), Kizimen (Russia), Manam (Papua New Guinea). Ongoing activity: Bulusan (Philippines), Dukono (Indonesia), Fuego (Guatemala), Karymsky (Russia), Kilauea (Hawaii, USA), Merapi (Indonesia), Pacaya (Guatemala), Reventador (Ecuador), Sakura-jima (Japan), San Cristóbal (Nicaragua), Santa María (Guatemala), Shiveluch (Russia), Soufrière Hills (Montserrat), Suwanose-jima (Japan), Tungurahua (Ecuador).